The Musician’s Way helps rising musicians develop numerous professional skills. The following resources expand on the concepts described in the text. MailChimp.com. Email newsletter service. Free for lists <2000. PayPal for business. Accept credit card payments on your site. Square. Accept in-person credit card payments via your mobile device. TuneCore distributes your music to iTunes, Amazon, etc. Shopify Shopping Cart Software. Create an online store. Dropbox.com. Backup, sync, and share files. Eventbrite.com. Ticket and promote concerts and events. Airbnb. Stay with hosts to lower touring costs. $40 off for new users! HarryFox.com. Buy mechanical licenses to record copyrighted music. SoundExchange.com. Collect digital performance royalties. SoundCloud.com. Share recordings and attract fans. BachTrack.com. Announce and discover classical events. SongKick Tourbox. Announce performance dates. Resources for Grantseekers. Links to grant sources & grant writing tips. New Music USA. Learn about and fund new American concert music. MusicalAmerica.com. Directory of classical/jazz presenters & performers. U.S. State & Regional Arts Orgs. A valuable list from the NEA. National Assembly of State Arts Agencies (U.S.). MusicTeachersHelper.com. Create a website in minutes, schedule online, accept credit cards, and more. 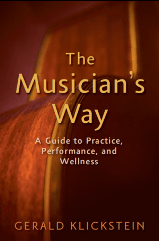 The Musician’s Way: A Guide to Practice, Performance, and Wellness, by Gerald Klickstein (Oxford, 2009; 14th printing, 2018). On Staff: A Practical Guide to Starting Your Career in a University Music Dept., by Donald Hamann (Oxford, 2013). From the Stage to the Studio: How Fine Musicians Become Great Teachers, by Watkins and Scott (Oxford, 2012). Association of Teaching Artists. Information and links. A Career in Music Therapy, from the American Music Therapy Assoc. Music Job Search Sites. Via the Peabody Conservatory (scroll down). International Musician. Orchestra jobs in the US. By subscription. muv.ac | VioWorld.com | Music-Job.com European orchestra vacancies. League of American Orchestras. Admin., conducting and other jobs. Musical Chairs. Orchestral and admin. job listings. MusicalAmerica.com. Arts administration and other jobs. International Society of Performing Arts – Facebook page. Bridge: Worldwide Music Connection. Useful database. Free trial. YapTracker. Opera auditions & voice competitions. $55/year. See the For Singers page for more voice resources. Music Career Articles on The Musician’s Way Blog. Lists of Music Careers, via the Berklee College of Music. Music Industry Quizzes. From the Future of Music Coalition. FracturedAtlas.org. Fiscal sponsorship, ticketing, education, and more. Flying with Your Instrument. Via the American Federation of Musicians. How to play in someone else’s band,” by Danny Barnes. Sage advice! The DIY Musician Blog. From CDBaby. CyberPR Blog. Online marketing tips from Ariel Hyatt. Career Tools from MindTools.com. Broadly applicable. Arts Journal. A digest of arts journalism. Incorporated Society of Musicians (UK). | Musicians’ Union (UK). Sample Press Releases, via MusicalAmerica.com. National Arts Marketing Project. A program of Americans for the Arts. “Make Better Marketing Plans with a SWOT Analysis,” by David Roberts. “6 case studies on successful online marketing,” by Jill Haverkamp. “How to post a perfect press kit on your website,” by Ariel Hyatt. Career Center at the Peabody Conservatory. Institute for Music Leadership. Resources from the Eastman School. Guidebooks from the Entrepreneurial Musicianship dept. at NEC. Bios That Inspire by Gerald Klickstein. Why do you need a bio? by Dan Kimpel. Writing the Dreaded Cover Letter, by Katharine Brooks. Beyond Talent (2nd ed. ), by Angela Beeching (Oxford, 2010). Companion site. The Musician’s Way, by Gerald Klickstein (Oxford, 2009; 14th printing, 2018). Getting Things Done: The Art of Stress-Free Productivity, by David Allen (Penguin, 2002). Tribes, by Seth Godin. How to build communities of followers (2008). Occupational Outlook Handbooks from the US Bureau of Labor Statistics: Musicians & Singers | Music Directors & Composers. Occupational Employment and Wages: Art, Drama, and Music Teachers, Postsecondary. From the US Bureau of Labor Statistics. Musician Salary Info. Links from the Peabody Conservatory. Salary Ranges for US Music Positions, via Berklee (2016). Salary Calculator, via the National Assoc. of Colleges & Employers. Strategic National Arts Alumni Project. Salary data and more. Facts and Figures Concerning Music and Higher Education in the United States,via the College Music Society (revised Jan. 2015). Bookkeeping for Artists, by Maggie Kruser. Healing with Music. An article on The Musician’s Way Blog. Corporation for National and Community Service (U.S.). Search for and post volunteer opportunities. Youth Music (U.K.). Resources and links. Future of Music Coalition. Education, research, advocacy. The Performing Arts Alliance. Coalition of performing arts advocates. The Texas Music Project. A model of music advocacy on the state level. The International Society for Music Education. Coalition for Music Education in Canada.